Management Information Systems (MIS) play a crucial role in an organization's operations, accounting, decision-making, project management, and competitive advantage. 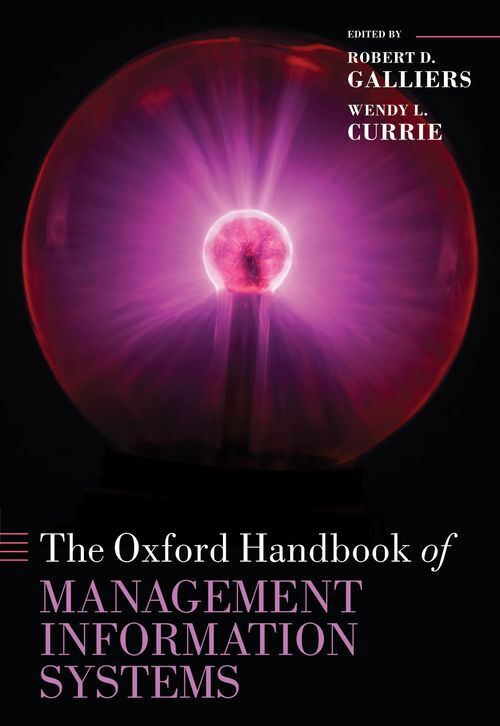 The Oxford Handbook of Management Information Systems takes a critical and interdisciplinary view of the increasing complexity of these systems within organizations, and the strategic, managerial, and ethical issues associated with the effective use of these technologies. The book is organized into four parts: - Part I: Background - Part II: Theoretical and Methodological Perspectives in MIS - Part III: Rethinking Theory in MIS Practice - Part IV: Rethinking MIS Practice in a Broader Context The Handbook provides expansive coverage of the discipline and a methodological and philosophical framework for discussion of key topics, before exploring the issues associated with MIS in practice and considering the broader context and future agenda of research in light of such concerns as sustainability, ethics, and globalization. Bringing together international scholars to focus on the theory and practice of MIS, this handbook provides a comprehensive resource for academics and research students in the fields of MIS, IS, Organizational Behaviour, and Management in general. 11. Post-structuralism, Social Shaping of Technology and Actor Network Theory: What Can They Bring to IS research? Robert D. Galliers was appointed Bentley University's inaugural University Distinguished Professor in July 2009, having served as Bentley's Provost and Vice President for Academic Affairs since 2002. He was previously Professor of Information Systems at the London School of Economics; Professor of Business Management Systems and Dean of Warwick Business School; and Professor and Head of the School of Information Systems at Curtin University, Western Australia. He is editor-in-chief of the Journal of Strategic Information Systems, has published over 70 articles in many leading international journals, and authored or co-authored 11 books, including: Exploring Information Systems Research (Routledge, 2007); the bestseller Strategic Information Management (Routledge, 2009); Rethinking Management Information Systems (OUP, 1999), and IT and Organizational Transformation (Wiley, 1998). ; Wendy L. Currie holds a PhD in Management and a BSc in Sociology. Currie is on the editorial board of ten academic journals and regularly publishes her research work. She currently serves as Hon Treasurer for the Fellowship of Postgraduate Medicine charity and is a Trustee of the Cardiovascular Research Trust. She regularly consults on the interface between business, management and technology and has recently completed assignments with Microsoft, Mouchel, 7 Layer, Deloitte, the Church of England and Barclays Capital.